GarageBand is the most accessible, affordable, and easy-to-learn multitrack recording application available. 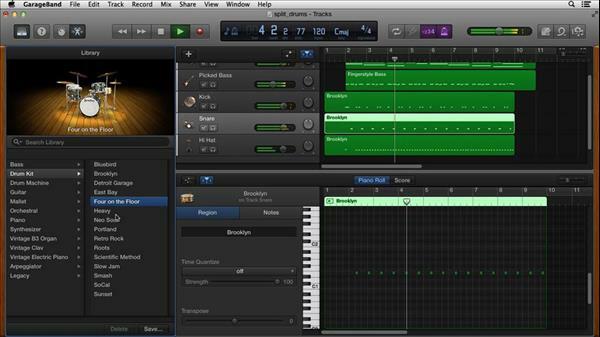 Learn how to start creating your own music with GarageBand here in this course. Garrick Chow shows how to create a new project, add loops (prerecorded sounds and drum beats) to quickly build a song, create your own custom loops, and use Drummer to create custom beats. He describes how to connect a MIDI keyboard controller and record with software instruments. Then he shows how to edit tracks, create a click track, and even print musical notation of your MIDI tracks. Next, he demonstrates how to record audio tracks into GarageBand, focusing on recording guitars and using multiple takes to create a comp track. Garrick then explains how to arrange, edit, and mix your projects using the arrangement track and the built-in effects. Next, he shows how to export your project, share it with the world, save it to iCloud, and archive it. Finally, Garrick shows how to use your iPad with GarageBand and how to open projects created in GarageBand for iOS, the mobile version of the app.